I’m holding on to Summer as long as I can at this point. It feels like it blew in super slowly and then bam, it’s back to school time, wait what? With Summer slowly rolling into Fall, I’m amping up my recipe box with some easy weeknight meals that can be made with items we usually already have on hand but still are different enough that the family doesn’t get sick of the same thing when we’re in a rush. You guys know how much I love an easy weeknight meal. Recently, I shared our 30-minute baja fish tacos and the response was incredible so I knew we’d be sharing another super easy weeknight meal that you can pull off with pretty close to no-planning (hello weeknight time saver!) and today I’m sharing one of my personal favourites. 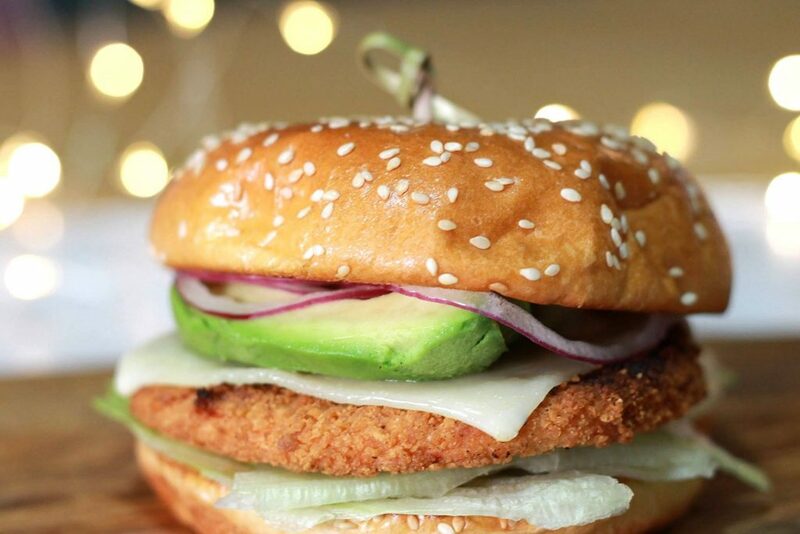 The weeknight chicken burger. Full disclosure, even though Janes is a sponsor of this post, my freezer is literally always full of their products. From Pub Style Chicken Strips to ultimates battered fish and ultimates chicken wings, they’ve been a brand we’ve loved for a long time that has always made our weeknight (and game night!) meals super easy, affordable and delicious. And our California Chicken Burgers using Janes Pub Style Chicken Burgers are no exception – both flavourful and juicy while satisfying even the pickiest eater at the table. Burgers are so versatile that you can add any toppings that suit your personal tastes and these are just a few of our favourites. 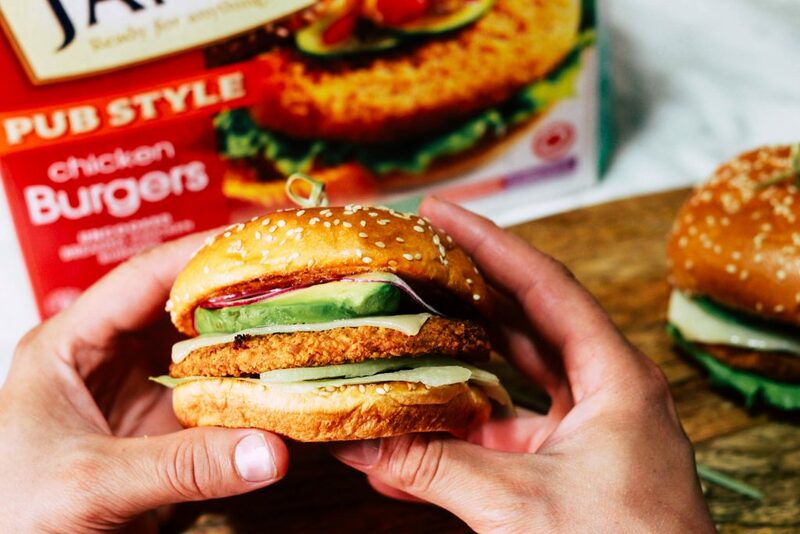 One of the best parts of having Janes Pub Style Chicken Burgers on hand is they are not only low in saturated fats, there’s no hydrogenated oils or artificial flavours. You’re getting good ingredients with no preservatives that you don’t need to feel guilty pulling out of the freezer after a long day. Mom win? You know it. My favourite part of this recipe is that you probably have most of what you’ll need already on hand, and if not it’s easy to grab a few small staples on the next grocery shop to get you through a few meals. 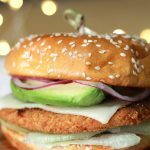 Janes Pub Style Chicken Burgers are a super affordable (and often go on sale at the local grocery store – stock up alert) and an easy option to have on hand for weeknight meals. They make pulling together a family meal on the fly super easy (even if you end up with a few extra neighborhood kids!). We love pairing our burgers with an easy side salad or baked french fries. We’re splurging and going with fries for this recipe! To start with this recipe, you’ll want to preheat your oven to 425 degrees celsius according to the Janes Pub Style Chicken Burgers box instructions, and start prepping your french fries. 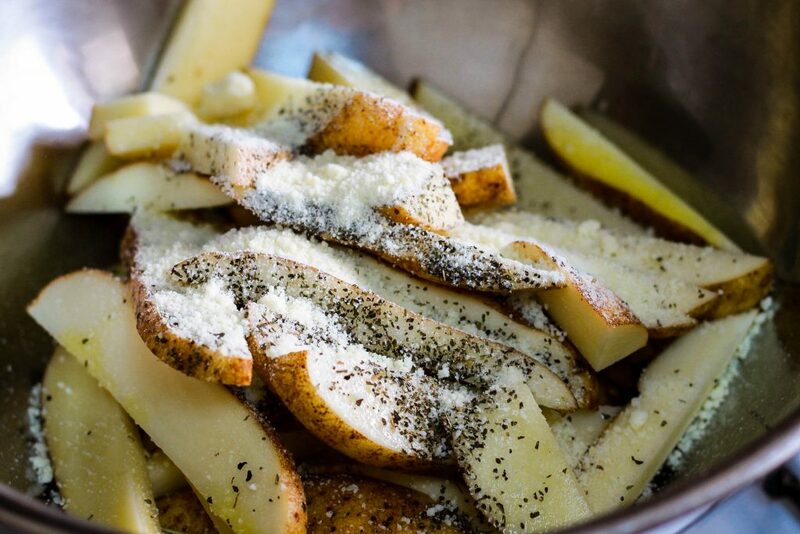 Cut washed russet potatoes into ¼ inch strips and toss generously with olive oil, salt and pepper, basil or your favourite french fry seasoning and parmesan cheese (optional). Lay fries in a single layer on a baking or pizza sheet and do the same for your Janes Pub Style Chicken Burgers. Pop into the oven and set your timer for 10 minutes for a flip and get to work on your garlic aioli spread. 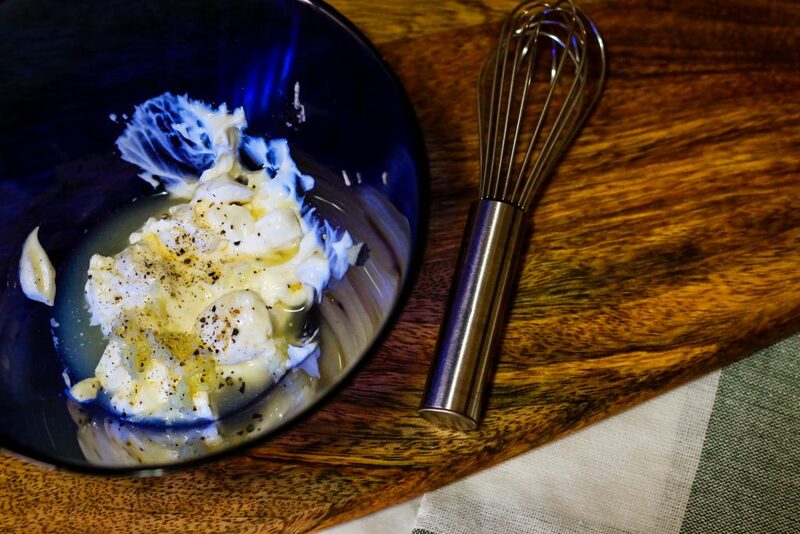 In a small bowl mix together mayonnaise, lemon juice, minced garlic, salt and pepper and slowly whisk in olive oil. I highly recommend doubling this recipe, you won’t regret it! Set aside in the fridge to chill and prep your buns. I always find hamburger buns to be a personal preference thing, whether you choose to go with traditional buns, kaiser, ciabatta or brioche, it’s entirely up to you. For this recipe I opted for brioche because yum, and I chose to toast ours which is entirely optional. You can skip this step if you prefer a softer bun, but I’ve found with the garlic aioli that toasting it keeps the bun crunchy and the spread where I want it. If you have a toaster oven you can pop them buttered side up to get a bit of colour, or in a non-stick frying pan set to medium-low heat and toast for 10-20 seconds per cut side. At this point you’ll want to flip your Janes Pub Style Chicken Burgers and french fries and set the timer for an additional 15 minutes. We keep our weeknight burger toppings pretty simple, lettuce, red onions, avocado and if you fancy, a slice of sharp cheddar. When the timer dings, you’re set for dinner! We like to build our own burgers at home and lay out a cutting board in the middle of the table with our toppings and it’s basically a free for all. 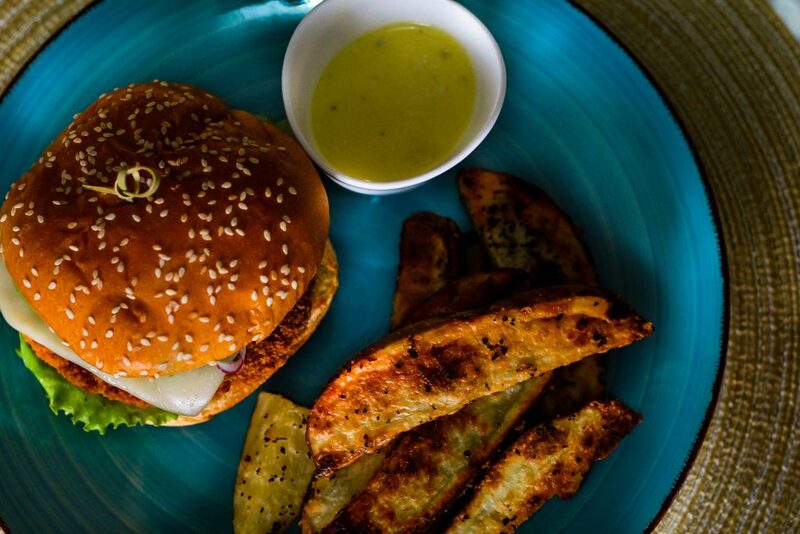 I highly recommend doubling up on the garlic aioli for fry dipping and being super generous with it on your California Chicken Burger – it’s delicious! 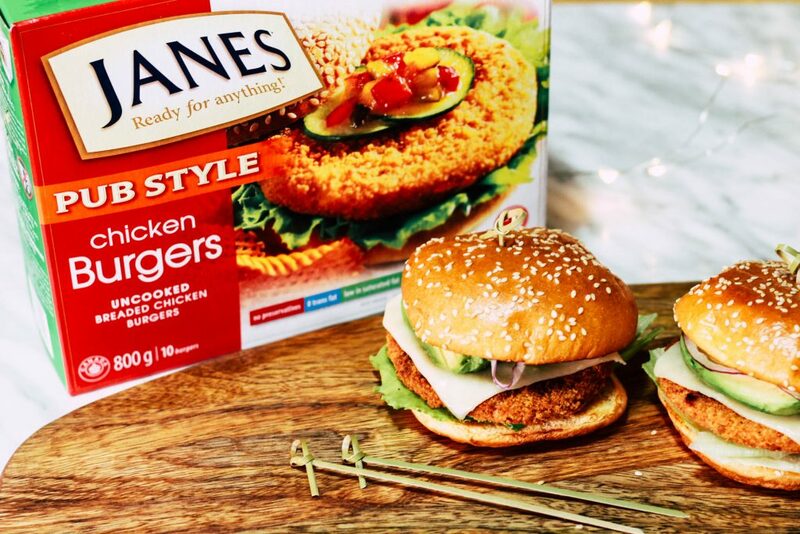 While we made this meal with the Janes Pub Style Chicken Burgers you can also try it out with the Janes ultimates Tender & Juicy Chicken Burgers if you prefer to go the unbreaded route. Either way, they are both a family favourite in our house and the result is equally delicious. From start to finish, you can complete this meal in 30 minutes. 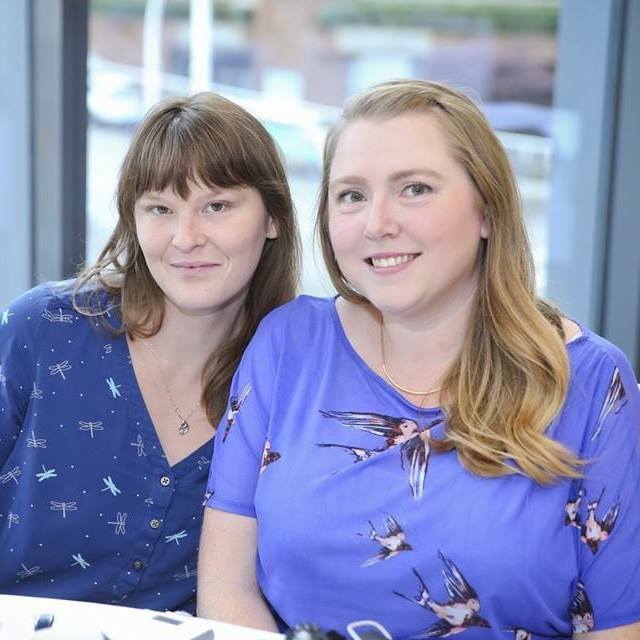 Want to shave a bit of time off? Prep the potatoes and garlic aioli the night before, or use a store bought sauce if you’re super pressed for time or ingredients and you’re set for an easy weeknight meal that the entire family will love. Recipe serves 4 – make as little or as many as you like, the recipe is generous! This weeknight recipe has perfect summer vibes with crispy chicken, creamy avocado and a delicious garlic aoili! In a small bowl mix together mayonnaise, garlic cloves, lemon juice and salt and pepper to taste, mix well and slowly drizzle in olive oil. Adjust seasoning as needed, then place in the fridge to chill. If you’re toasting your buns, this would be the time to do it! Brush any open sides of your hamburger buns with melted butter and place in a medium-low heat frying pan and flip every 10-20 seconds. Keep a watchful eye, they can burn quickly. By now your timer should have dinged, flip the fries and Janes Pub Style Chicken Burgers and reset the time for an additional 15 minutes. Next up is prepping your toppings. Lay out your toppings on a cutting or serving tray to serve at the table, our favourites include avocado, red onions, lettuce, a sharp cheese and if we’re feeling fancy, some crispy bacon. 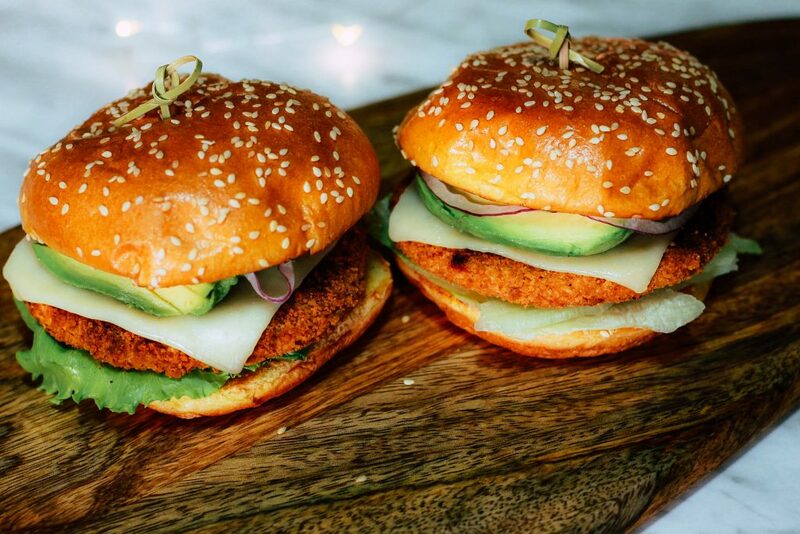 Assemble your delicious chicken burgers and enjoy! This is one of our families favourite weeknight meals and is incredibly adaptable to personal tastes. Whether you’re prepping during a crazy weeknight rush or cooking for a group on the weekend, you can make as few or as many as you like and it’s sure to satisfy the entire family. 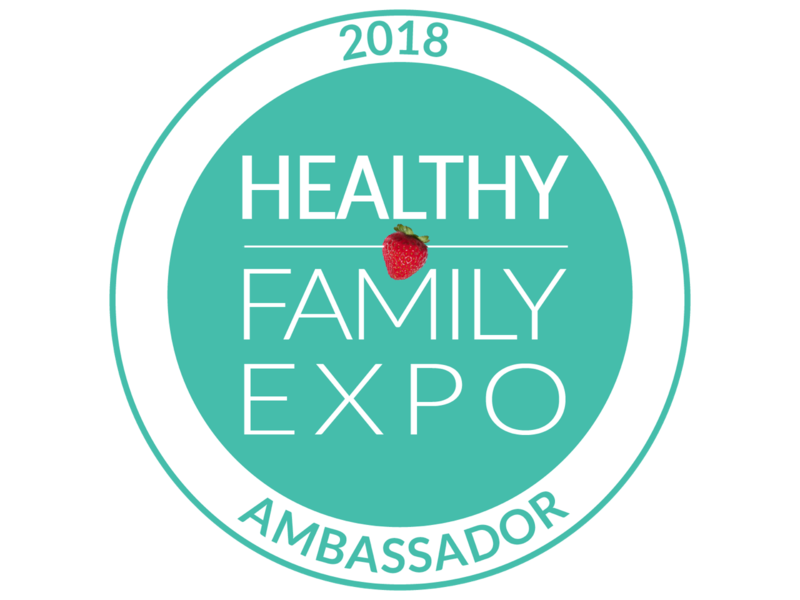 Prepping for Fall with Costco Canada + Exclusive Event Invite! I love these recipes! I’m definitely going to try making these for my picky eaters! yum! that looks really good. nothing like a great burger and fries recipe! What a bunch of delicious looking recipes! Can’t wait to try them!We love Jane’s products!!! Making that garlic aioli for my next burger, and homemade fries are the best. Yummm adding this to my week meal plan! My favorite weeknight meal is chicken, rice and broccoli. We love chicken burgers and usually have them once every two weeks. We love making chicken burgers! The Jane’s Burgers can be used for anything. One of my favorite and fast weeknight meals is to use them as the main for Chicken Parmigiana – bake them and add some marinara sauce and mozzarella during the final stages. Some pasta on the side and we’re set!! This looks amazing! 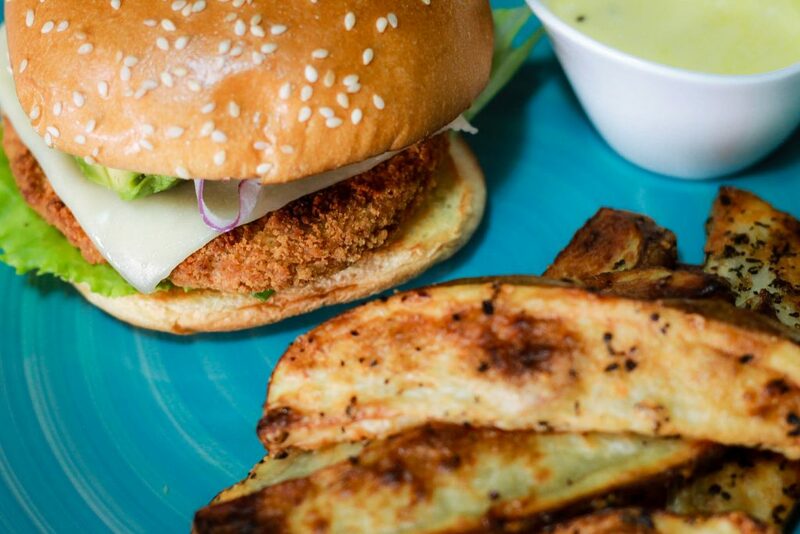 Chicken burgers are definitely our family favourite dinner! Janes chicken strips pub style with kale chips and sweet potatoes vedges! My girls really enjoy hamburgers, i should definitely introduce them to chicken burgers. This looks delicious!! I love chicken pot pie dish in the slow cooker…super easy and yummy! I love Janes chicken burgers and I also like to use them for easy chicken parmesan, just spread some pasta sauce on and layer some mozzarella on top and viola easy chicken parm!! My son loves Jane’s chicken strips – they’re a staple in our house. And my daughter loves burgers. This idea might be the best of both worlds! My boys really love spaghetti with garlic bread for dinner. It’s easy and delicious. We often make the Janes chicken nuggets, with a veggie side, and a pack of Sidekicks. Our simple weeknight dinner for sure. Tastes good! I love Janes chicken strips with fries and coleslaw. I’ll try chickem strips first ! I like lasagna and garlic bread. My girls love Janes chicken strips! My favourite weeknight meal is making wraps with Janes chicken strips. The kids love them! Our favourite weeknight meal is one-pan meals with meat and veggies combined. I love a yummy chicken or shrimp stir fry with basmati rice. It is quick and nutritious! My favourite weeknight meal is usually a pasta, either chicken caesar linguini or spaghetti or lasagna. Always with garlic toast or garlic cheese biscuits and sometimes with a salad. Thanks! Fave weeknight meal when I’m rushing is Janes Wholewheat chicken strips and fries!! We always have Janes burgers and fries on Friday,it’s the kids favourite meal of the week!! My favourite weekend meal is a burger with side. My husband and I are in a small farming community so we are always busy. I love having things in the freezer that easy to heat in the over or pan like Chicken burgers. My favourite weekend meal is Pizza on Friday so I can just crash and then a big family meal on Saturday and Sunday. Fast a quick meal is Chicken strips and ceasar salad. Then use the left over strips for lunches. Weeknight California Chicken Burgers sound great! Weeknight California Chicken Burgers sounds great! One of our favourite weeknight meals is crispy chicken Caesar salad wraps. Nom nom Nom!! My favourite weeknight meal for fall/winter is normally a pot of hearty of soup, but burgers are a go-to meal for us as well (beef, chicken, turkey … the boys are not really too picky when it comes to the protein I use). Chicken strips and Caesar salad is my favourite quick chicken meal. Chicken burgers or nuggets, fries and a salad is one of my sons fave weeknight meals! Homemade pizza is my favourite weeknight meal. Your recipes look delicious! Thanks for sharing them! This is definitely something my family would gobble up in a minute! We are going to have to try it this week, thank you for the wonderful idea! Oh man! These look so good!!! Yum! Definitely giving this one a try!